The United Nations Headquarters is a distinctive complex in New York City, United States, that has served as the official headquarters of the United Nations since its completion in 1952. It is located in the Turtle Bay neighborhood of Manhattan, on spacious grounds overlooking the East River. 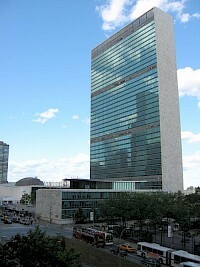 The United Nations has three additional, subsidiary, regional headquarters or headquarter districts. These are located in Geneva (Switzerland), Vienna (Austria), and Nairobi (Kenya). The United Nations Secretariat Building is a 154 m (505 ft) tall skyscraper and the centerpiece of the United Nations Headquarters, located in the Turtle Bay area of Manhattan, in New York City. It has 39 stories and was completed in 1952. The building was designed by French architect Le Corbusier and the Brazilian Oscar Niemeyer.